All transactions are safe and secure with a reliable history in online purchasing behind each of our associates. Buy the Sloth Goonies Costume t-shirt to own Goonies clothing and merchandise. 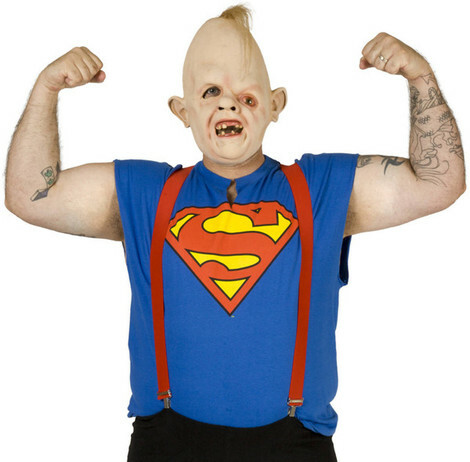 In addition to showcasing the most sought after Goonies t-shirts, this Sloth costume will have you repeating the Sloth Goonies quote, "Hey you guys!" in no time. Embody the beloved Goonies movie character who responds to Chunk's kindness and eventually helps to defend the Goonies. The criminal Fratelli brothers (including Sloth) and the kids from the Goon Docks search for the hidden treasure of the 17th century pirate, One Eyed Willie, who hid his treasure along the Astoria, Oregon coast. In addition to the Sloth Goonies Costume tee above, browse the Goonies Clothing Gallery for more apparel like men's and women's clothes, kids shirts or hoodies.